If you’re looking for the ultimate in maintenance free backyard fire pits, you’ll definitely want to go with one that is made of stainless steel. Not only are they elegant to look at, a stainless steel fire pit is inherently rust resistant, extremely durable and has an extended outdoor lifespan, especially when compared to carbon steel or cast iron varieties. 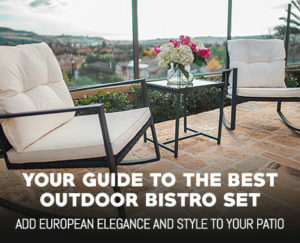 In the past, we’ve reviewed many of the best fire pits and chimineas for patios, but today we’re going to put only the best stainless steel fire pits head to head and see which one comes out on top. For reference we’ve put together the below table so you can quickly compare our top choices and easily choose the best stainless steel fire pit for you. While a stainless steel fire pit by itself may look incredible, a few additional design elements on such piece go a long way to making it the focal point of any outdoor space. The Fire Sense Stainless Steel Urn is a perfect example of this. With a beautifully pewter finished base wrapped in scrolling steel bars it is a jaw dropper to say the least. We love the rustic yet modern look of this fire pit and it’s the perfect addition to any backyard. 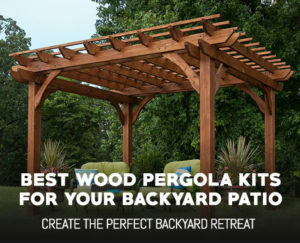 Plus, with the included wood grate, spark screen cover and lift tool you’ll have everything you need for a roaring nighttime fire right out of the Box. With a large 30” diameter these is ample room for friend and family to gather around the flickering flames for an evening of fun. 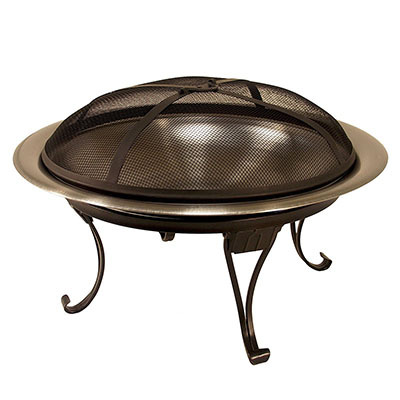 Portability wise the Fire Sense Urn Fire Pit is only 22.7 pounds making it easy to reposition around your patio or backyard to accommodate more guests. The Double Flame Patio Fire Pit is very similar to the Solo Stove Bonfire in almost all regards. It has a similar double walled design to superheat incoming air and increase the efficiency at which is burns wood. Not to mention the hotter burning temperatures reduce smoke output to almost zero for a great wood fire experience. 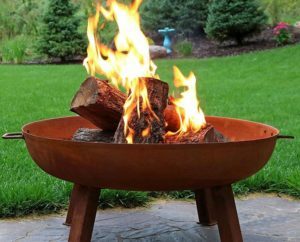 It differs in that this fire pit is a bit larger at 22” in diameter and is made from stronger stainless steel, making it more resistant to damage, but less portable at 42 pounds. The quality of the Double Flame Patio Fire Pit is exceptional however and the toned-down design and simplistic operation make it a great fire pit choice. We were also super please with the optional 15” swing-away grill as it made cooking on this fire pit a breeze and was super easy to detach and clean after we were done. As an ultra portable stainless steel fire pit, the Catalina Creations 26” Heavy Duty Portable Stainless Steel Fire Pit is an incredible addition to this list. 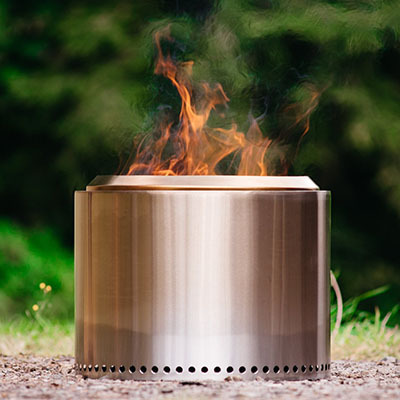 With a whopping 26” diameter burn surface and coming in at 13.2 pounds this is extremely large, yet very light option for people who are on the go, yet want a more traditional fire pit. Even better, this unit comes with a canvas carrying case to make taking it with you an easy option as well as eliminating any soot stains on vehicle interiors. We also enjoyed the high quality spark screen and lift tool that came included. The only downside to this unit is the rather thin stainless steel that makes up the fire bowl. We prefer our fire pit to be a bit more robust to better take the high heat and inevitable bumps and bangs. However, the lower price tag reflects this and makes for a great budget option. Last up on our list for the best stainless steel fire pit is the compact, yet stylish Unique Arts 18-Inch Stainless Steel Mini Fire Pit. 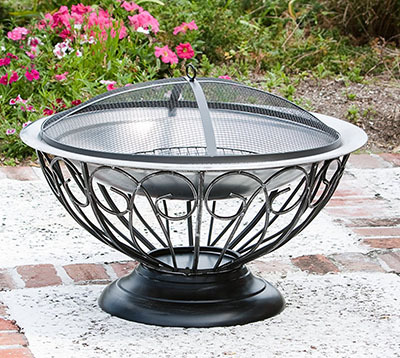 As the name suggests this micro size fire pit is only 18 inches in diameter and is perfect for smaller spaces and apartment patios. At only 10 pounds it is easily carried around to any part of the yard or quickly stashed in a trunk for easy transport. We also like this thick wall design which allow you to use both wood and charcoal for a variety of fuel choices. As you can expect the small size also comes with a small price tag and the Unique Arts Fire Pit is a perfect option for those of you on a budget. However, you won’t be getting a spark screen or lift tool so you’ll need to pick those up separately.